Jerusalem is considered to be the holiest city by all 3 Abrahamic faiths namely Christianity, Islam & Judaism. In last few days, it has come into limelight after US president, Donald Trump declared it as a capital city of Israel which got criticism and condemnation from several countries and massive protest by Palestinians who also regard it as their capital. The rock on the top of the mountain is considered to be the stone of foundation (Even Hashetiya in Hebrew). Jews believe that earth was created from this stone and Adam was created by God on this stone. Christians believe that God had ordained Abraham to sacrifice his son Isaac in order to test his faith in god. When Abraham was willing to do so, God changed Isaac with a sheep and thereby rewarding Abraham with his son. This happened on top of the holy mountain (Moriah). Muslims believe that God had ordained Abraham to sacrifice his other son Ishmael in order to test his faith in god. Rest part of the belief stays the same. Because of the significant importance of this place, Jerusalem has been in centre of battles and wars for centuries. King Solomon built the first temple over the rock in around 1000 BC. Later, the Babylonians destroyed it around 586 BC when they invaded the city. After that the Persians took control of the city and reconstructed the temple by around 516 BC. King Herod wanted to build a glorious temple on the rock but found it difficult due to the existence of the natural hill so in order realise his dream, He first built walls around the hill and created a big sand platform on top to create a large flat surface on the top to later build temple. However, the dream of building a temple on the top was short lived when it was destroyed by jewish rebellion in the year 70 AD. 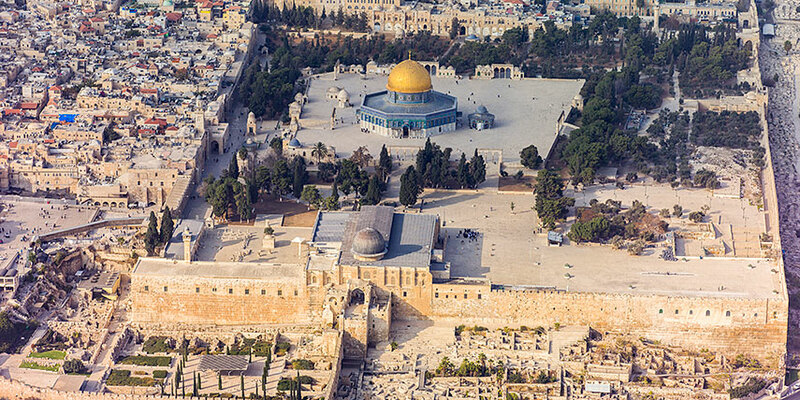 In around 638 AD, during the siege of Jerusalem, The Rashidun caliphate took control of the city and built Al Aqsa mosque on the top of the mountain. Muslims believe that Prophet Mohammed ascended to heaven from the top of this mountain. During the Crusades of 1099 AD, Christians took control of the holy city. They did not destroy the mosque but simply removed the crescent from the top (symbol of Islam) and replaced it with a cross (symbol of christianity). The temple was named as Temple of the Lord (Templum Domini). Around the year 1187 AD, muslims took control of the holy city again (King Saladin of Ayyubid Sultanate) and replaced the cross with crescent converting the temple in to mosque again. Since then, the mosque stands on the site and that specific place hold high reverence in Judaism and Islam (Christians pray in the church of holy Sepulcher which is a few metres away from the site). Next 450 million USD for a painting!